The Putnam Block Redevelopment will revitalize downtown Bennington with vibrant, mixed-use spaces. There will be office, residential, restaurant, retail spaces and open space areas. The location of the project is in downtown Bennington and includes the former Hotel Putnam and several adjacent historical buildings, and the former H. Greenburg & Son hardware store property. The Ninja Path will provide a safe and comfortable walking, biking, and running route between Bennington College and Downtown Bennington, and points in between. Phase 1 will be a 12-foot wide, paved, multi-use path that will connect the Bennington College entrance to Hannaford Plaza. Phase II will be an interim dirt path connecting the end of the Phase I path to the Hicks Avenue Pedestrian Bridge. 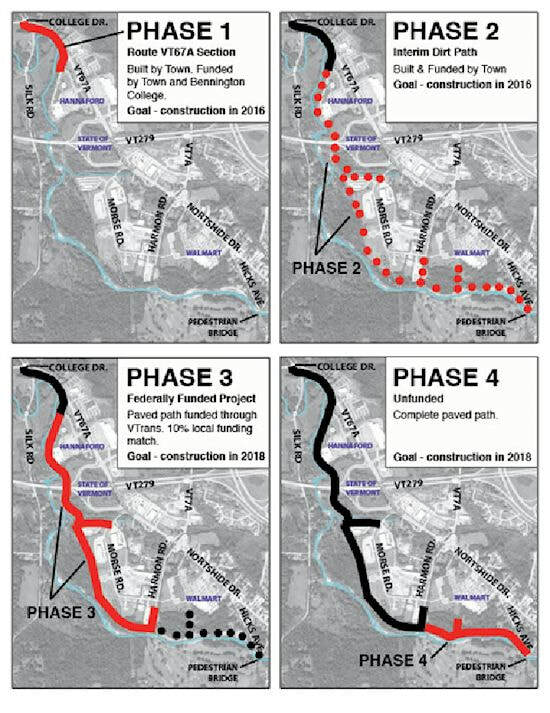 Phase III will be a paved path from Hannaford to Harmon Road, which will include a bridge across Furnace Brook. Wish to work with BCRC? RFQs and other bids are posted on the news page. Public hearing notices and other important announcements are listed on the news page. Looking for funding for your municipality? Click here to see what is currently available. Want to know what is happening at BCRC? Click here to view the newsletter. Ready to join the Commission or serve on a Committee? (view list at top of page) Contact BCRC staff ​about volunteering.